On July 1st, 2017 India consolidated various state and central government taxes into a singular, nation-wide tax. Goods and Service Tax (GST) was introduced across India with the aim of improving economic conditions across the country. It is the biggest tax reform since India’s independence and was celebrated by the central government as economic progress for India. A few weeks later, I began my research in Ajmer, Rajasthan. Here, I became interested in the lived experiences of informal recyclers, namely those who collect various recyclable materials from solid waste streams to sell as their main form of income. Informal recyclers tend to be low caste and many have done this work since childhood, working alongside their parents. Informal recycling is often the only form of income for families and in my experience is usually done by women. Most of the women are illiterate and work without protective equipment; several single-handily support large families. In Ajmer, many of the people engaged in informal recycling activities live in one of two informal settlements. These settlements are organized around caste and lack many basic services. One settlement in particular has been stigmatized by members of Ajmer’s middle class population as unsafe and its’ residents untrustworthy. This stigma further contributes to the discrimination and lack of bargaining power faced by those engaged in informal recycling activities. 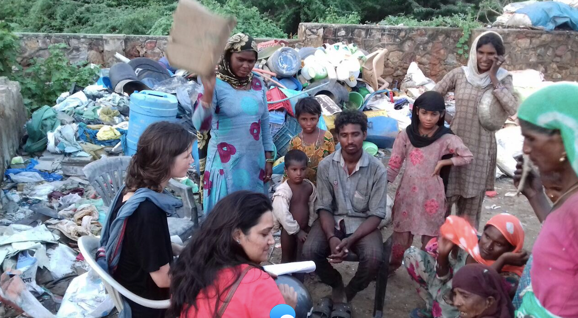 As Ajmer has no formal waste segregation system, informal recyclers play a huge role in recovering resources from households, roadsides, and municipal dumping sites. 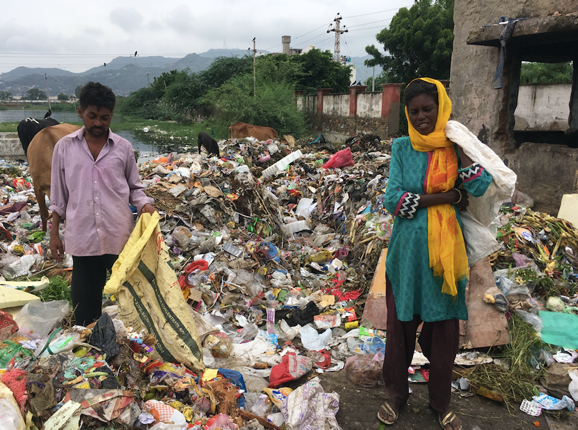 As such, informal recyclers lessen the impact of waste on the environment and decrease the amount of materials ending up in Ajmer’s central landfill. Salvaged materials are cleaned, sorted, and then sent away to processing plants in Delhi or Jaipur to be melted down and then resold to various manufactures. This supply chain keeps costs down for manufacturers as recycled materials are often cheaper than virgin ones. People engaged in informal recycling activities are incentivised by economic return. For each kilogram of plastic, metal, glass, or paper collected, individuals receive anywhere from 5-20 rs. When prices are low, it is not economically viable to collect certain materials, such as soft plastics. This means more materials are left for municipal governments to deal with, costing government solid waste management schemes more money. When prices for materials are high, more materials are metabolized by the informal sector, alleviating pressure from municipal systems. Prices for recovered materials are set by a multitude of factors, all of which are reliant on a variety of dynamic elements, which are determined far away from the streets and settlements of Ajmer. However, these factors, which range from market demand to government policies, have very real implications for the livelihoods of individuals and families involved in informal recycling. One such example of this, is the aforementioned GST. While I did not initially linger on the implications of GST role out, or consider how it would intersect with my study, I have since reconsidered my position. Previously, most recyclable materials were taxed at 2.5 percent. This tax was payable by the operators of large-scale processing plants, which are largely located in big urban centres, like Delhi and Jaipur. Since GST however, all materials sold to large-scale processing plants are subject to a whopping 18 percent tax (The Hindu, 2017). Although the informal recycling sector in Ajmer does not pay GST directly, income levels of those involved in the informal recycling sector have been slashed by nearly 50 percent. Higher level dealers, who are subject to GST, look to maintain their profits by decreasing the amount paid per kilogram of material to secondary collectors. Secondary collectors in turn, are also forced to pay less per kilogram to individual rag pickers to maintain some level of profitability. Subsequently, it has been individual rag pickers who have experienced the most drastic decrease in income since the introduction of GST. For example, many individuals have shared with me that prices for common materials, such as clear plastics, have fallen from 10rs per kilogram to 5rs per kilogram. This drastic change in price per kilogram means individual recyclers are now making anywhere from 100-150rs per day, when before July 1st daily incomes were upwards of 300rs per day. Without any bargaining power, individual recyclers are forced to accept this new reality. It is clear that the central government has neglected to consider how GST would impact the informal sector, but interestingly enough, a law was passed in 2016 (by the same government) validating the role of informal recyclers in India’s solid waste management scheme. Further, an 18 percent tax on recyclable materials is a disincentive for recycling and is therefore out of line with one of the central government’s keynote programs, Swachh Bharat, or “Clean Indian Mission”. The role out of GST is yet another of example of the real life implications of top-down policy making. Without a holistic social-environmental assessment of new policies, there will always be unintended consequences. More often than not, these unexpected outcomes have disproportionate implications for people who are the least equipped to deal with them. Individuals involved in informal recycling are far removed from the central government’s decision making process, but after July 1st, most individuals I have spoken with have reported over a 50 percent decline in daily income. If nothing is done to protect the daily wages of those involved in informal recycling, the sector will collapse. Many individuals have already shared with me that recycling is becoming less and less viable, but continue to collect materials daily as no other work is available. This often means traveling farther or working longer days for less return. Individual recyclers lack bargaining power and without a collective voice or meaningful grass-root organization, the informal recycling sector will continue to face significant economic hardship as well as continued stigmatization from mainstream society. I hope my research can highlight some of the on the ground implications of various top-down government schemes, as well as give some voice to those on the frontline of Ajmer’s informal recycling sector. Hello! My name is Sasha.  I am a fourth year geography and environmental studies student at the University of Victoria. Right now, I am completing a six month internship in India with an NGO called PRIA. PRIA takes a participatory approach to research and development practice and I have been working alongside the sanitation team in Ajmer, Rajasthan. This blog is a reflection of my time spent living and learning in India.